We believe in developing programs that can be executed globally during an actual event. The capability to deliver these programs is unique in the field and a key distinction we offer customers working in fields that involve high risk and the potential for business disruption. We offer a planning philosophy grounded in a mature knowledge transfer process designed to enable our clients to effectively manage business continuity internally without significant additional overhead. Business Process Recovery: The process initiated to resume business operations to a level consistent with the business requirements. 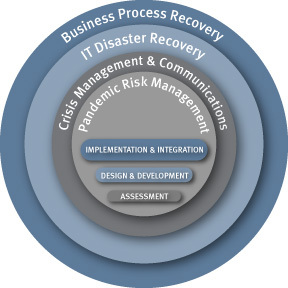 IT Disaster Recovery: The recovery of information technology (IT) processes, systems, applications, databases and network assets used to support critical business processes. Crisis Management and Communications: A series of actions taken to gain control of the event quickly to minimize the effects of an interruption and prepare for recovery. Offers a consulting approach that delivers a customized version of our easy-to-use, cost-effective, web-based planning tool that enables long-term plan maintenance. Protiviti also has played a key role in helping to shape business continuity education. Our continuity consulting leaders have contributed significantly to the creation of the Federal Emergency Management Agency (FEMA) course on Continuity of Operations (COOP). We also developed a dedicated continuity program assessment for federal agencies that supports and complies with Federal Preparedness Circular-65 (FPC-65). Protiviti’s planning tool is easily adapted to the requirements of FPC-65, including assistance in understanding relationships between essential functions, key personnel and facilities to address, and external resources necessary for the department/agency to develop a sustainable COOP program.